The new Crit' Air system is used on high pollution days to prevent the worst polluting vehicles from driving in the affected cities. They've banned cars registered before 1996 (and vans registered before 1997) from entering the city between 8am and 8pm, Monday to Friday. This law has been in effect since last year. However, the new regulations require vehicles to display a sticker that shows just how polluting it is, on a scale of one to five. On days when smog is particularly bad, they can extend the ban too, for example, all vehicles with a '4' or '5' grade sticker (as these are the most pollutant). Tourists and visitors are not exempted from this new law. It applies to the entire city of Paris, unless you’re simply passing through on the Paris Ring Road (Boulevard Périphérique) - as many Brits do when they head to the south of France. You can get your Air Quality Sticker for your vehicle from the official website here. Be aware of other websites that sell the stickers as these sites have been known to charge excessive administration costs. At the official site, vehicle owners will pay just €4.80 while the others are charging up to €30. Those who don’t have stickers are in danger of being fined up to £135. If you have ordered the stickers and are concerned about the progress you can track their orders on the Government’s official Crit’Air website and always keep a copy of your order receipt. How should you decide on the right Sticker? A vehicle will be graded on a scale of one to five (five being the most pollutant), but there is an additional sticker for green vehicles that are 100% electric or hydrogen powered. You will have to see which of the following categories your vehicle fits into based on the European Emissions Standards that each road vehicle must adhere to. 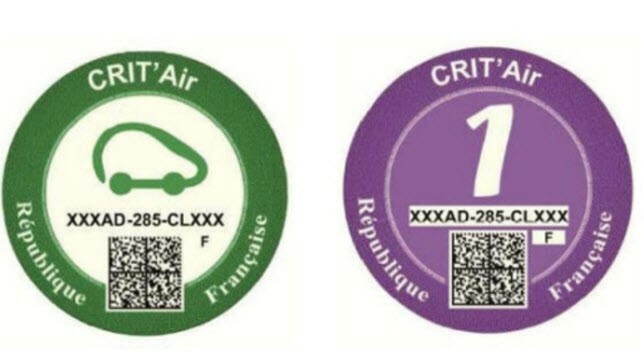 The year of build of the vehicle and the emissions levels determines which level the vehicle falls into, and which certificate it will need while driving in France. (For example, if anyone drives a 2004 diesel vehicle, they’ll need a CRIT' AIR 4, Dark Red Sticker). For green vehicles that are 100% electric of hydrogen powered. Plug-in hybrid cars and Euro 5 and 6 petrol models (registered from 1 January 2011). Euro 4 petrol-powered cars (registered between 1 January 2006 to 31 December 2010) and Euro 5 and 6 diesel models (registered from 1 January 2011). Euro 2 and 3 petrol cars (registered from 1 January 1997 to 31 December 2005), Euro 4 diesel cars (registered between 1 January 2006 to 31 December 2010). Euro 3 diesel cars registered between 1 January 2001 and 31 December 2005. Euro 2 diesels, registered from 1 January 1997 to 31 December 2000. One last thing - as of July 1st 2017, vehicles with a category 5 sticker were banned from Paris between 8am and 8pm, Monday to Friday. Please visit the official website for more details.